Manticores are large, roughly leonine beasts that can be found in the hotter lands of the material plane. Possessing intelligence near that of an average human, they are far more cunning and cruel than other carnivorous animals. sThey spend most days hunting for food, which they relish in both killing and eating with the aid of their claws, toothed maw and barbed tail. 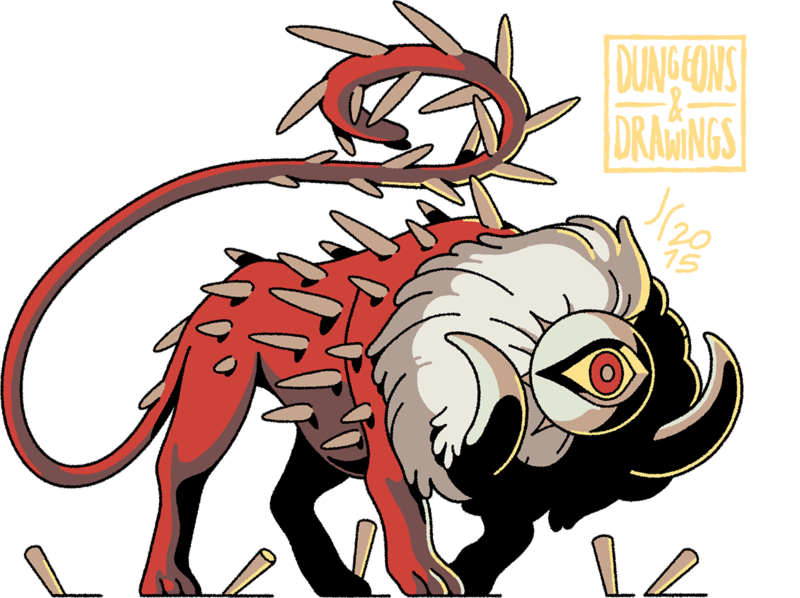 Also capable of human speech, manticores are sometimes mistaken for the usually better-natured sphinxes (with their human-featured heads and cat-bodies) - an error which is swiftly regretted. Another monster with its roots in classical mythology, the manticore was one of my favourites as a child. It's typically depicted with a scorpion's sting in its tail (a trope I chose to sidestep just for the sake of trying something different) and as a long-time fan of bugs and insects I always sorta liked that little concession to monstrousness in an otherwise pretty mundane animal. I know the head I have it is pretty weird, but I quite like how videogamey it looks. In hindsight I think I was channeling the bull charger from Okami. 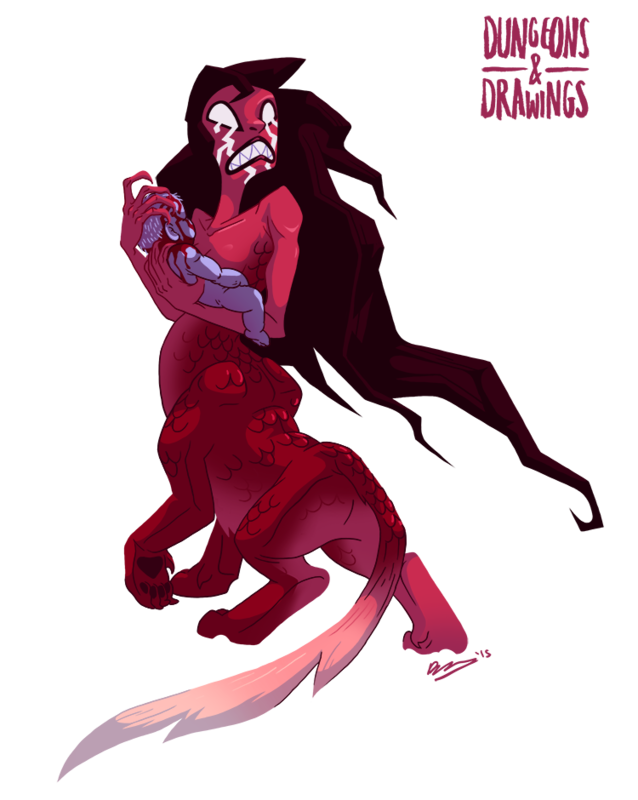 The Lamia are a race of vaguely leonine centaurs which inhabit deserts. They are also fond of human flesh. The human half of the Lamia are exceptionally attractive. Well, possibly. Lamia are illusionists and charmers, capable of taking on human guise. Their touch also has a stupefying effect, making the effects of their spells all that more effective. The illustration of the Lamia in the Monster Manual always kinda bothered me because everybody knows Lamia are snake-women duh Wizards. Well turns out the duh may be a bit on me. Doing a bit of research of the monster actually revelead a few things. For starters, there are numerous interpretations of what the Lamia looked like, among which is a woman who is a snake from the waist down. But it seems like the D&D Lamia was inspired by the Lamia from Topsell's The History of Four-Footed Beasts, a 17th century book, though that illustration may have been inspired by an even earlier one. Helps make it a bit different from Medusa and Naga. The Greek myth of the Lamia is actually a somewhat interesting and confused one. The bare bones is Lamia is a Lybian princess who has the misfortune of catching Zeus' eye. She gives birth to babies, Hera kills her babies (and makes Lamia eat them), and Lamia is driven mad by grief and rage. She feels compelled to steal children and devour them. At some point she turns into a monster, the physical appearance of which is left vague. Also she can't close her eyes, but is able to remove them from her head. From that point on she tends to get mythologically confused with drakainae (female dragons), and empusa and lamaie (succubi and vampires). The Greek gods were jerks. So the Lamia is one of many monsters seen worldwide throughout folklore: that of a woman who loses/kills/eats her children and goes to do the same to other children. La Llorona seems like the most modern version of that archetype, though I wouldn't be surprised if there were urban legends that followed a similar narrative pattern. The Cockatrice, despite being on the small side and having little physical strength, can be a dangerous creature to contend with for even seasoned adventurers. Around the size of a small pony, it can attack with its claws and beak with some ferocity if angered. More problematic by far, though, is its magical gaze, which can instantly turn the recipient to stone. The Cockatrice would doubtless be a less famed creature if not for this ability. 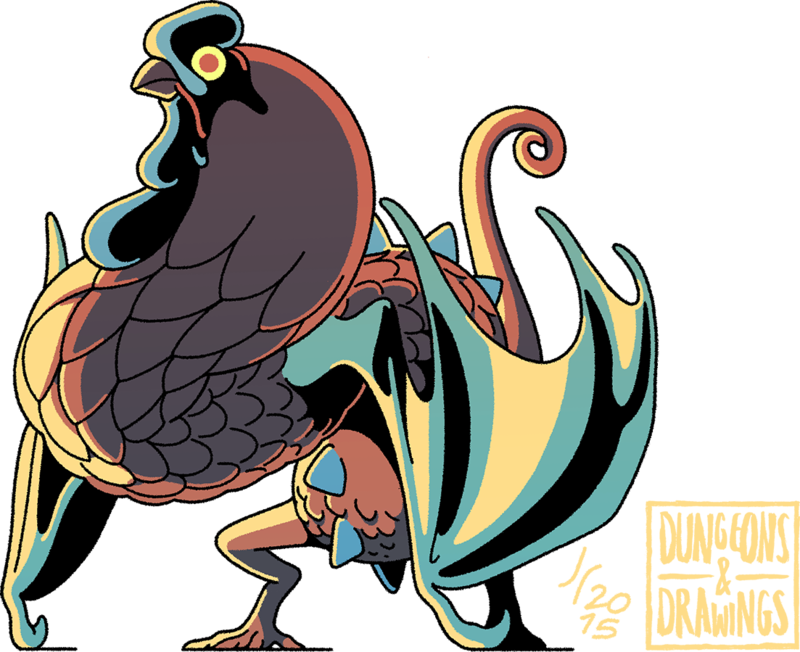 Its body, an absurd amalgam of drake and cockerel, poses little threat to a well-armoured combatant, and its intelligence is animalian. But the Cockatrice is relatively common, and can be found in small flocks in many parts of the material plane, and where they do congregate near human habitation, they can pose something of a serious problem. but yeah, hope you like my Cockatrice. Chickens are great fun to find reference images of, particularly the big fluffy fat-looking ones. 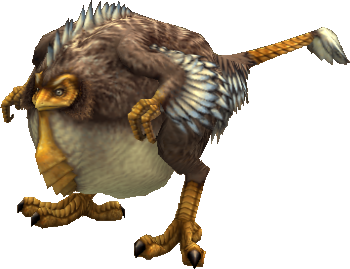 For pop-culture depictions of Cockatrices the ones in FFXII are some of my favourites! Though with a name similar to the Phase Spider, the Phase Wasp is called as such not because it can travel between dimensions, but because it can attack between dimensions. Your ordinary Phase Wasp is a creature of the Material Plane, a magical insect about a foot long (yikes), but without the venom that ordinary wasps have. 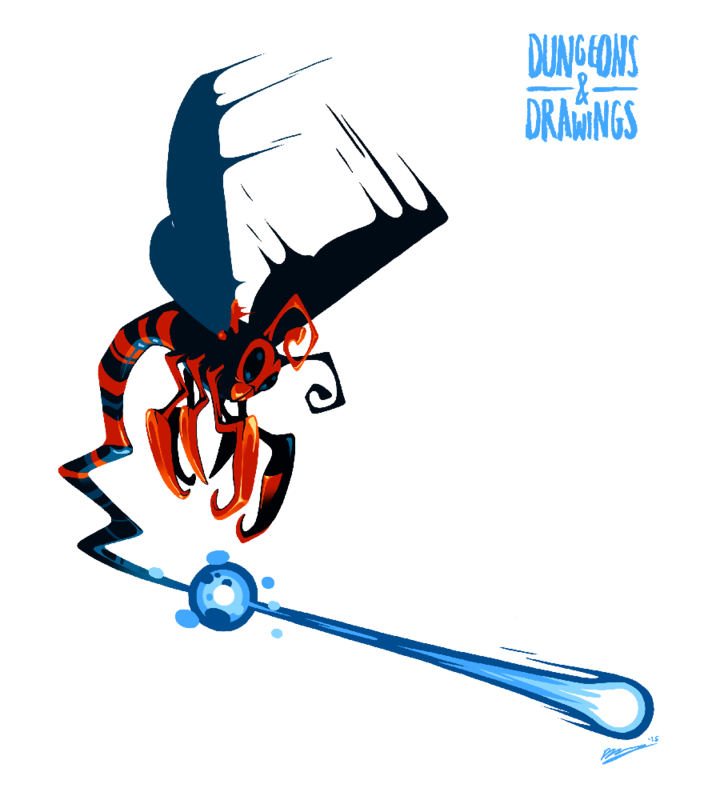 Instead, their stinger shoots bolts of force, as per the magic missile spell, which allows it to hit creatures whose bodies are in the planes which are overlaid over the material. The wasp also has the natural ability to see invisible creatures which, again, helps it defend itself against etheral creatures. The source of the Phase Wasps' magical powers are not explained, but I have my own theories. Like ordinary wasps, these dudes make their nests out of chewed wood pulp and paper. They have a special fondness for making them out of the papers of spell books, which makes a Phase Wasp infestation especially bothersome for mages. So my theory is that Phase Wasps at some point in the past were ordinary wasps just looking for materials for their nests. A couple of conveniently available magical libraries you have a new breed of giant magical super-wasps. Thanks a lot, wizards.